I’ve been having a real love / hate relationship with my hair recently. I haven’t had it cut in far too long and although I’m really loving the length of it, I’m finding that it is starting to look in pretty poor condition. In the winter months I blow dry my hair to try and get some volume in there (silly thin hair!) and in the summer I leave it to air dry but spritz with salt spray to give it some texture and movement. This, and the beautiful sunny weather we’ve been having, has left my tresses feeling and looking pretty dry which I hate as there’s nothing nicer than smooth, silky, hydrated hair. I’ve also been swimming a lot recently (the summer bikini panic has set in!) which has been drying it out even more. 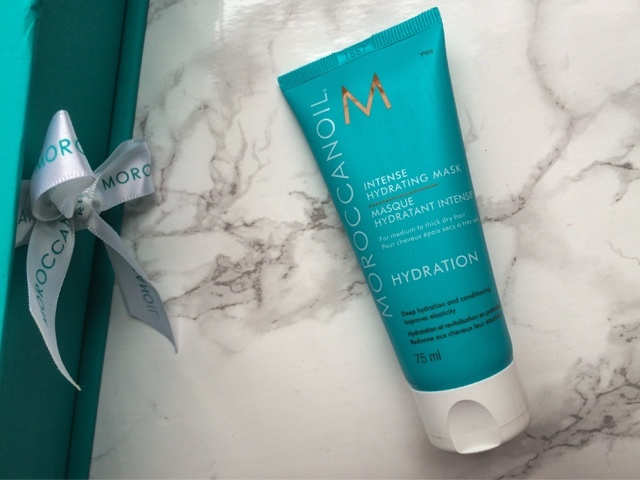 So when the hair care queens at HQHair.com got in touch and asked if I’d like to try out some MoroccanOil products, which are renown for their luxuriously hydrating properties I couldn’t wait to give them a go! 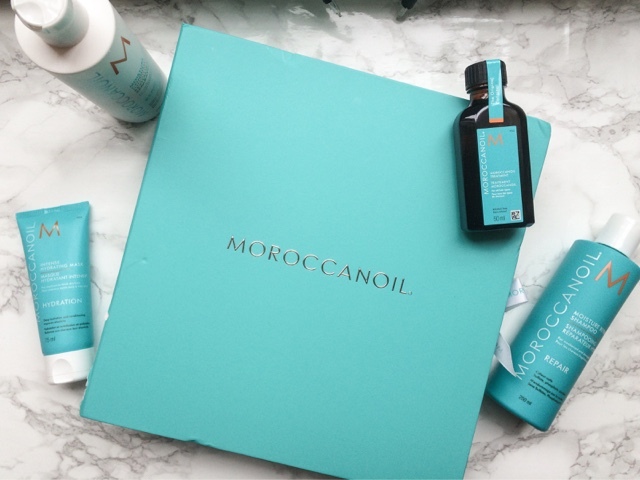 I was kindly send a gorgeous big box of goodies (which I’m totally keeping to store my jewellery in) and I just love the packaging of MoroccanOil. The bright turquoise colour is one of my faves (as you may be able to tell from my blog design!) and the splashes of orange and white are so summery and pretty. 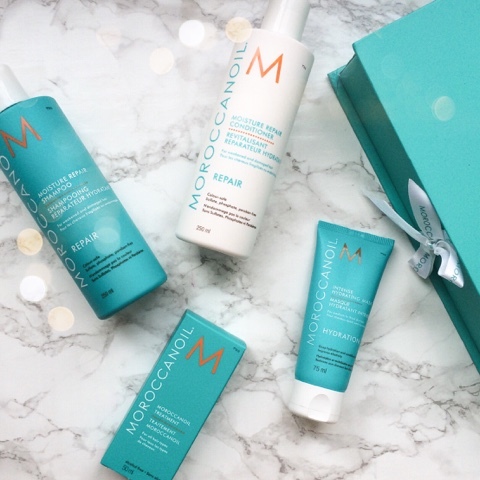 My gift box included the MoroccanOil Moisture Repair Shampoo*, MoroccanOil Moisture Repair Conditioner*, MoroccanOil Treatment* and MoroccanOil Intense Hydrating Mask*. This exact gift set doesn’t appear to be available on the HQ Hair website just yet but all the products included are available to buy separately. 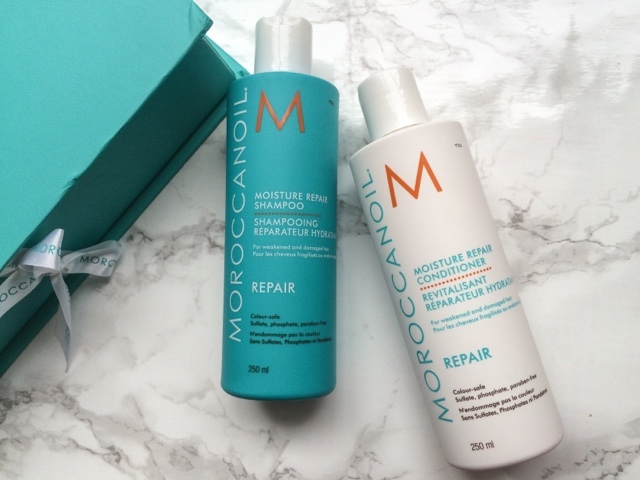 The MoroccanOil Moisture Repair Shampoo claims to be “A gently cleansing, fortifying formula that helps to rebuild damaged hair with antioxidant-rich argan oil, reinforcing keratin and fatty acids. To improve elasticity, moisture and shine.” Just what my hair needs! It smells absolutely divine – that gorgeous light floral salon scent – and lathers up so well, feeling really luxurious. It definitely does make my hair feel like it has been repaired – it felt a lot stronger and healthier even after one wash! It gives that amazing squeaky clean sensation which I am obsessed with (and wrote about in my June favourites post) and leaves my hair feeling really soft and invigorated, which is just what it has been crying out for. Thank you MoroccanOil!!!! Similar to the Moisture Repair Shampoo, the Conditioner’s “gently detangling, fortifying formula conditions hair with antioxidant-rich argan oil, reinforcing keratin and fatty acids to revive hair and make it more manageable”. I use this throughout the ends of my hair and find it makes my hair so silky. Where my hair is quite fine it can get incredibly knotty and take ages to brush through but this helps ease out any tangles, which means I need to attack my hair less with a hairbrush, causing less damage. My hair is also so much shinier from using the Moisture Repair Shampoo and Conditioner, even when later spritzed with a mattifying salt spray. 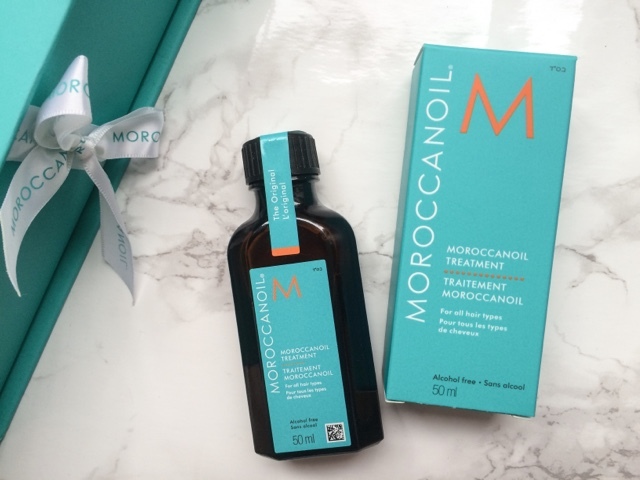 The MoroccanOil Treatment is “a unique formula rich in antioxidant argan oil that instantly absorbs into hair to immediately enhance manageability, shine and deliver long term conditioning without leaving residue”. I was a bit nervous to use this at first as I was scared the oil would sit thickly in my thin hair, leaving me looking more greaseball than glamour puss. The Treatment oil is recommended for all hair types however and I have been making sure to add just a small amount and running it though my hair in the evenings. Although most of the oil does absorb quickly to my hair, where mine is so thin, if I use a bit too much (which is easy to do as it is an open bottle, no pipette opening or anything) it can make it look slightly greasy. I think if you have thicker hair though it should be fine as it is a very light weight oil. I’ve been enjoying applying it and plaiting my hair before going to bed and when I wake up in the morning having loose waves and super soft hair. This hair Mask has literally transformed my hair! I’ve been applying it on the ends of my towel dried hair every Sunday to let it do its thing as a “high performance argan oil rich treatment hydrates and conditions dryness to improve texture, elasticity, shine and manageability”. As soon as it has been washed out my hair feels incredible! So soft and smooth and it looks really shiny and healthy too. It seems to plump up my hair, despite not boasting volumising properties and gives it that fresh cut feeling and salon shine, which is incredible considering how ratty my ends have been looking recently! It is recommended for medium to thick dry hair, but has done wonders for my fine hair, without weighing it down or leaving any residue. This is firmly part of my pamper routine now and my hair is so so thankful! This will be a great product to take on holiday to give it a pick me up from being in the sun, sea and pool. Have you used any MoroccanOil products before? 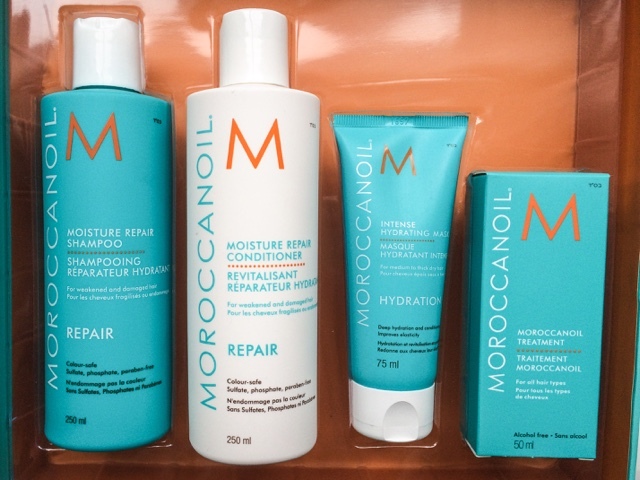 *Thanks so much to HQ Hair for inviting me to try out these lovely MoroccanOil products. All thoughts are honest and my own. For more information please see my Disclaimer Page.